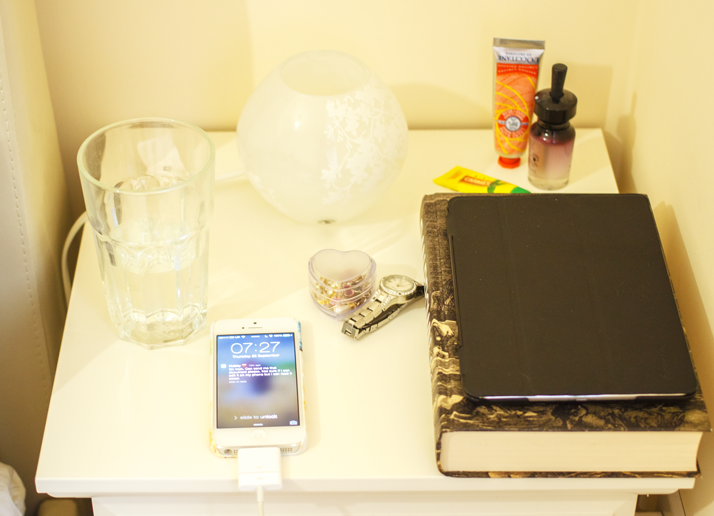 I keep things very simple on my bedside table; I hate having clutter there and I only keep the essentials. I do all my evening skincare before I get into bed, so I don’t need to have those products there, taking up room. You might already know that I’m a massive geek, so it’s no surprise that my bedside table has more nerdy things than beauty things! The actual table is the BIRKELAND Bedside Table from IKEA (HERE), and I couldn’t recommend it enough. I know the quality of IKEA furniture can sometimes be a bit hit and miss (I do not recommend the PAX wardrobe – biggest waste of money ever! ), but this table feels very durable and sturdy. The hubby and I bought two of them and they look really pretty in our room. 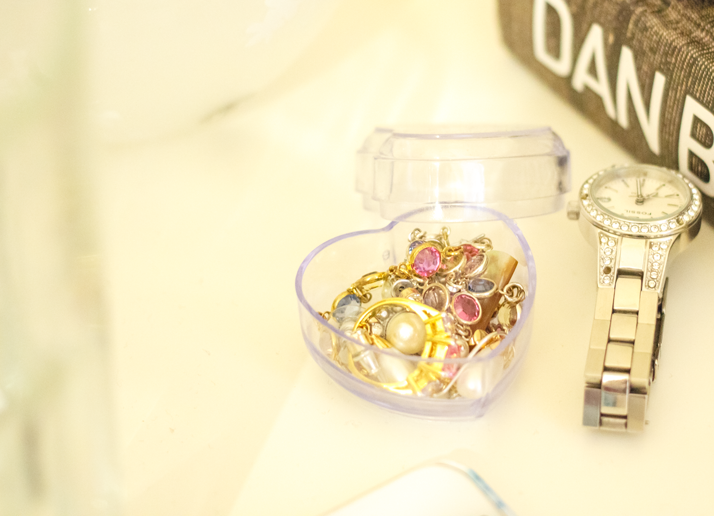 First I have a little plastic heart-shaped container where I put all the jewellery I’m wearing when I go to bed. I think it came with a necklace I got from my mum, so I’m not sure where you’d get it. It’s the ideal size for me, because I can get really lazy and forget to put everything back in my main jewellery box, so this little box is great as it only fits a handful of things. My watch doesn’t fit in there, so it stays on the side; it’s from Fossil, in case you’re wondering, but it’s really old and I’ve lost some of the crystals (similar HERE). 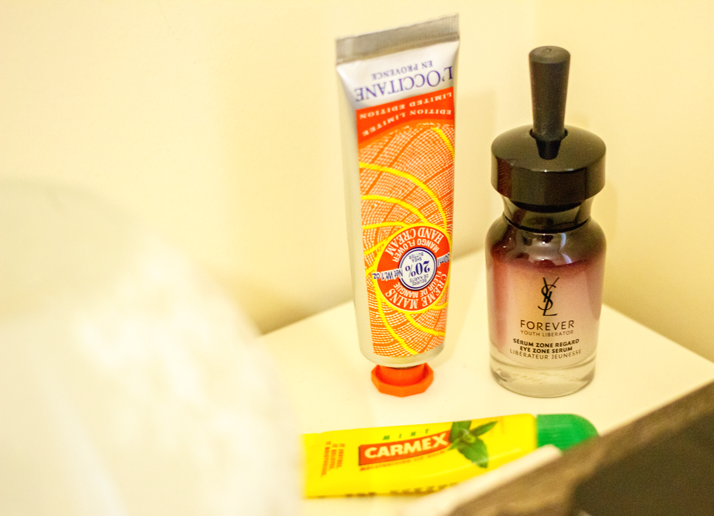 Next I have my little beauty corner with some essentials; Carmex lip balm (HERE), L’Occitane hand cream (HERE) and YSL Eye Zone Serum (HERE). Like I said before, I do my evening skincare routine before I get into bed, so these are the only products that I may reapply before I actually go to sleep. 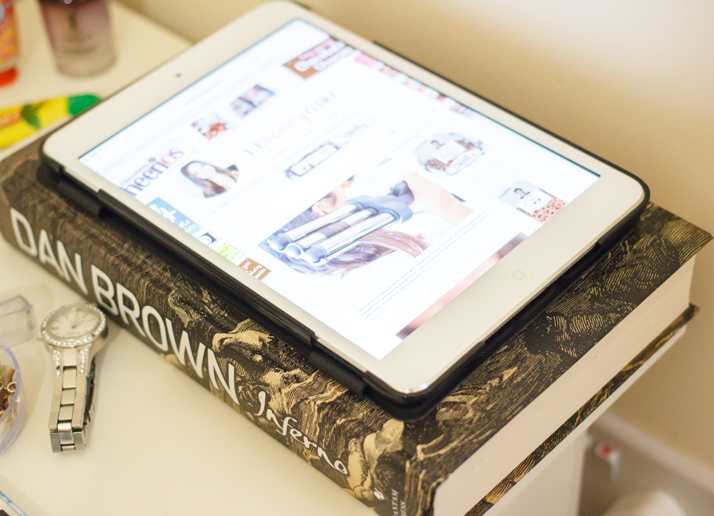 Then I have the book that I’m currently reading, ‘Inferno’ by Dan Brown (HERE) and my iPad Mini (HERE). I totally recommend ‘Inferno’, it’s such a typical Dan Brown book and I love all of his books; I’m halfway through it and all I can say is that Mr. Langdon is in serious trouble right now! The iPad Mini is a fairly recent purchase, but I much prefer it to the original iPad; it’s more compact, lighter and it suits all my needs. 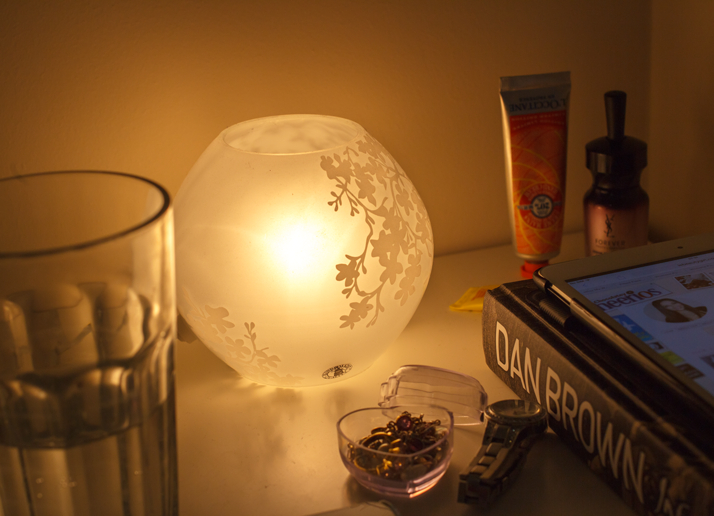 My lamp is also from IKEA, it’s the KNUBBIG Table Lamp (HERE) and I think it looks so cute when it’s lit up. At first I wasn’t too sure about it, because I thought it looked really small and a bit lost on my table, but I’ve grown to really like it. The glass is mouthblown, so each lamp is unique, which I think it’s quite nice. Last but not least, I always have a glass of water because I get really thirsty throughout the night, and I have my iPhone 5 (HERE), which I always charge when I go to bed; I actually bought an adapter (HERE) to fit all my old Apple chargers into my iPhone 5 and iPad Mini, so that’s why that charger looks a bit chunkier than normal iPhone chargers. My nightstand looks very similar! Always love your blog posts! Also I was wondering where is your multi color crystal bracelet from? I have noticed it on your videos and I really like it. Last but not the least, miss your haul videos, hope one is coming soon! Much love and good luck! How sweet are your teddy bears! 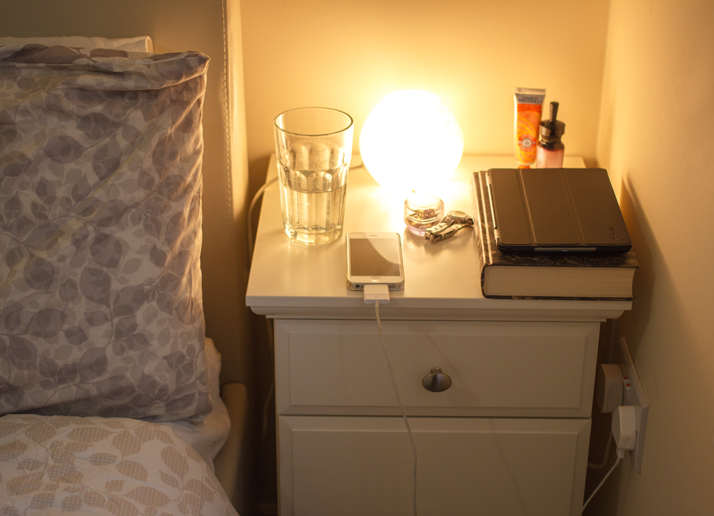 I try to keep my bedside table free of too much clutter. I seem to accumulate lots of lip balms and magazines on mine.